It will take you longer to read a book on an iPad or Kindle compared to the printed page, according to a recent study. Dr. Jakob Nielsen of the Nielsen Norman Group--a product development consultancy that is not associated with Nielsen, the metrics company--compared the reading times of 24 users on the Kindle 2, an iPad using the iBooks application, a PC monitor and good old fashioned paper. The study found that reading on an electronic tablet was up to 10.7 percent slower than reading a printed book. Despite the slower reading times, Nielsen found that users preferred reading books on a tablet device compared to the paper book. The PC monitor, meanwhile, was universally hated as a reading platform among all test subjects. Nielsen's findings were based on the performance of 24 users who "like reading and frequently read books." The subjects each read different short stories by Ernest Hemingway on all four platforms, and were measured for their reading speeds and story comprehension. Overall, it took each user an average of 17 minutes and 20 seconds to read a story regardless of the platform and comprehension levels were virtually identical on all four reading formats. However, Nielsen says the printed book was the clear winner in terms of speed. Users were reading 6.2 percent slower on an iPad compared to paper, and 10.7 percent slower on the Kindle 2. Nielsen did not provide any statistics on the reading time for the PC monitor. Interestingly, Nielsen's results appear to show that reading on the iPad is significantly faster compared to the Kindle 2. But Nielsen was quick to dismiss this conclusion arguing that the reading speeds between the two devices were "not statistically significant." "The difference [between reading times on the iPad and Kindle 2] would be so small that it wouldn't be a reason to buy one over the other," Nielsen wrote. The study also asked each user to rate how they liked each format on a scale of 1 to 7. The iPad, Kindle 2, and printed book were nearly tied at 5.8, 5.7, and 5.6 respectively, while the PC monitor ranked last at 3.6 points. The test subjects said that reading on the PC felt too much like being at work, while they found it more relaxing to read a printed book than on an electronic device. So it appears technology hasn't quite figured out yet how to replicate the experience of the printed page. That said this study leaves a lot to be desired owing to its small test group size, but it would be interesting to see a similar study on a much larger scale. I'd be curious to find out, for example, if there's any big difference in reading speeds based on age groups. Would people in their 20s read faster on a screen than a book since they've spent a majority of their lives consuming digital content? How would the younger group compare to people in their late 30s and early 40s who also grew up with electronic devices such as the Commodore Vic-20, the original Mac, and IBM clones? This study also left out reading on a laptop, which is a far more mobile reading experience than a desktop PC and could therefore be more enjoyable. I'd also like to know if the iPad would remain a faster reading experience than the Kindle in a larger study. On the one hand, the iPad can render a new page faster than the Kindle, which could account for the uptick in speed. But you would think the Kindle's ability to closely mimic the printed page, thanks to its e-ink display, would bring its reading speeds closer to the traditional book. 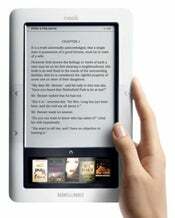 Regardless of how fast people can read on an electronic device, the e-reader is becoming more popular every year. E-books raked in $313 million in 2009 growing by 176.6 percent compared to 2008, overtaking audio book sales. In 2010, e-book sales are currently growing at a rate of 217.3 percent versus 2009, according to estimates by the Association of American Publishers. If you want to check out Nielsen's findings for yourself, you can find it here. It's a fairly short read, but if you're pressed for time you might want to print it out.